Samsung MWC 2018 – The South Korean tech giant Samsung is all set to launch its latest smartphones Samsung Galaxy S9 and Galaxy S9+ today at the Galaxy Unpacked 2018 event in Barcelona. Samsung has already released several teaser videos for the Galaxy S9 and S9+, in which, the brand mentions that its new Galaxy flagships will flaunt advanced camera capabilities. The smartphones will be powered by Qualcomm Snapdragon 845 SoC (in US region) and the latest Exynos chipset in the UK and Indian markets. As far as the pricing is concerned, going by the launch price of the older Galaxy S8, the Galaxy S9 is expected to cost around Rs 60,000. Both the smartphones are expected to be available by March end. Apart from minor tweak in performance and camera, the S9 and S9+ is expected to be similar to presents Galaxy flagships. The phones will be IP 68 dust and water resistant. The Samsung S9 will feature a 5.8-inch QHD+ Super AMOLED curved display with a pixel density of 570 ppi while the S9+ will have a 6.2-inch display. Both will be powered by Android 8.0 operating system. The Galaxy S9 will come with 4GB of RAM while the bigger S9+ could come with 6GB of RAM. Both the phones are expected to offer 64GB onboard storage with the option of an expandable memory card slot of up to 256GB. However, Samsung could launch 128GB or 256GB storage variant as well. With Qualcomm Snapdragon 845 coming into the equation, the device will support Gigabit LTE connectivity. On the camera front, there 12MP rear camera with OIS on the S9 while the plus variant will have a vertical dual-lens setup like the iPhone X at the back. Of course, there will be Bixby and wireless charging option along with USB Type-C. Samsung has retained the 3.5mm headphone jack and will also provide free AKG earphones. The battery capacity will be similar to the S8 and S8+. The smaller one will come with a 3,000 mAh battery while the S9+ will have a 3,500 battery. Alongside both the smartphones, Samsung is expected to also launch new fast wireless charger. The wireless charging pad will not be very different from Samsung’s current offering and might just be slimmer and flatter than before. The new wireless charger, with the model number EP-N5100, will sport two charging coils, with only one of them being used at any point of time. The wireless charger will work on the Qi wireless charging standard. 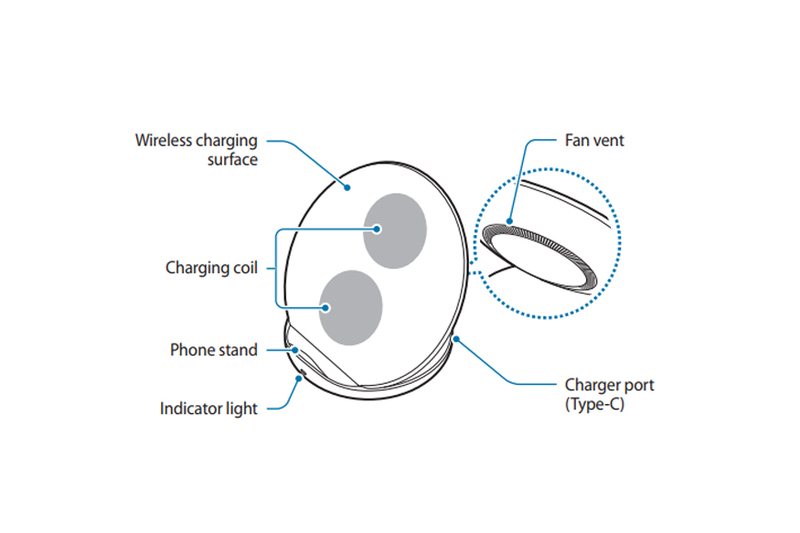 The new Samsung wireless charger will carry a USB Type-C connector at the back to serve as the point of connection to the power source. In addition, it will have an indicator light at the front and a fan at the back to dissipate heat. The indicator light will glow in varied colours, with Red indicating charging, Green – Ready and flashing light – error. Samsung had unveiled the Samsung DeX last year along with the launch of Samsung Galaxy S8. Recent leaks by tipster Evan Blass on Twitter have confirmed a new model of the DeX to be unveiled alongside the Galaxy S9 as well. 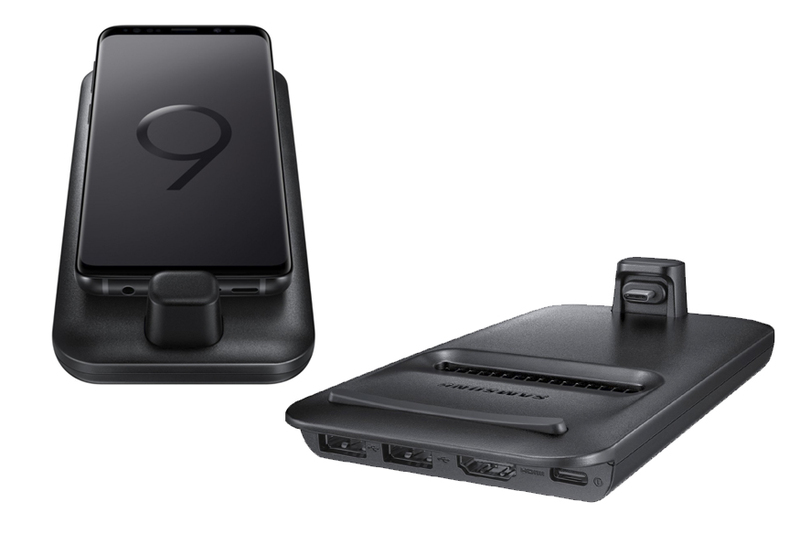 The new DeX will sport a USB type-C connector for plugging the Galaxy S9 or the S8, as reportedly, it is backwards compatible. In addition, it will come with two USB ports and one HDMI port. Through the DeX, Samsung Galaxy S9 users will be able to convert their smartphone into a desktop, by using an external screen, mouse and keyboard.